Curing of cement concrete is defined as the process of maintaining the moisture and temperature conditions of concrete for hydration reaction to normally so that concrete develops hardened properties over time. The main components which needs to be taken care are moisture, heat and time during curing process. Why curing of cement concrete is required? To prevent the concrete to dry out prematurely due to solar radiation and wind. This prevents plastic shrinkage of concrete. It helps to maintain the concrete temperature by allowing the hydration process. Hydration process requires water to carry on and releases heat. Curing helps the concrete to harden and bond with internal materials and reinforcement. This helps to prevent damage to bond between concrete and reinforcement due to vibration and impact. This helps development of impermeable, crack free and durable concrete. What is the right time for curing of concrete? The time to start curing of concrete depends on the evaporation rate of moisture from the concrete. The evaporation rate is influenced by wind, radiant energy from sunshine, concrete temperature, climatic conditions, relative humidity. The evaporation of moisture is driven by the difference in vapor pressure on concrete surface and the in surrounding air. When the difference is high, evaporation rate is high. 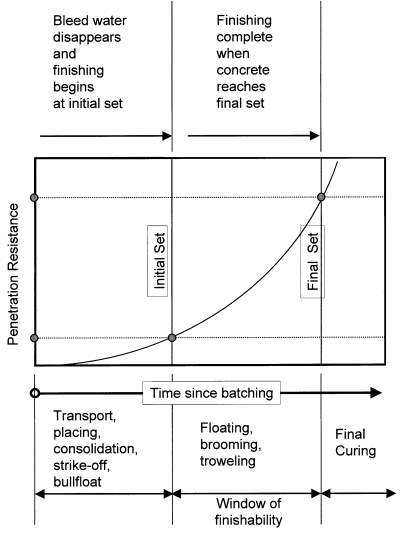 ACI 308 – Guide to Curing Concrete suggests three phases of concrete curing. These phases are shown in figure 1.6 of ACI 308. When the concrete is placed and compacted, bleeding of water occurs and rises through the surface of concrete due to settlement of concrete. The rate and duration of bleeding depends on many factors including concrete mix properties, depth or thickness of concrete, method of compaction of concrete etc. These bleed water starts to evaporate from the surface. When all the bleeding water has disappeared from the surface, the drying of concrete starts, then initial curing of concrete is required to minimize the moisture loss and prevent plastic shrinkage cracks to concrete before and during finishing operations. The initial curing of concrete can be done by techniques such as fogging or using the evaporation reducers, or by providing the sunshades and windscreens. Intermediate curing is done when the concrete surface finishing operations has been carried out before the final setting of concrete. This happens when the required surface texture of concrete member is achieved rapidly or when the setting of concrete is delayed. When the concrete is finished after the final setting of concrete, the final curing of concrete should be done. This helps to prevent surface drying of concrete because the loss of moisture from the concrete surface occurs immediately. 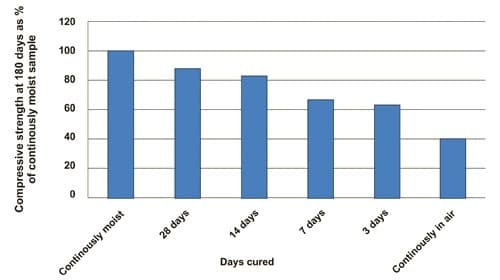 What is the duration of cement concrete curing? Curing of concrete for longer duration increases the strength and durability of concrete structural member. The following figure explains how the compressive strength of concrete increases with time when it is cured for longer duration. The reason for curing i.e. to prevent plastic shrinkage, temperature control, strength and durability of concrete. The American Concrete Institute (ACI) Committee 301 recommends a minimum curing period corresponding to concrete attaining 70 per cent of the specified compressive strength. The often specified 7 day curing commonly corresponds to approximately 70 per cent of the specified compressive strengths. The Indian Standard IS 456 – 2000 recommends that curing duration of concrete must be at least 7 days in case of ordinary Portland Cement, at least 10 days for concrete with mineral admixtures or blended cements are used. It also recommends that the curing duration should not be less than 10 days for concrete exposed to dry and hot weather conditions and 14 days for concrete with mineral admixtures or blended cement in hot and dry weather.